For fans of Crazy Rich Asians: Meet the Wangs, the unforgettable immigrant family whose spectacular fall from glorious riches to (still name-brand) rags brings them together in a way money never could. Charles Wang, a brash, lovable businessman who built a cosmetics empire and made a fortune, has just lost everything in the financial crisis. So he rounds up two of his children from schools that he can no longer afford and packs them into the only car that wasn’t repossessed. Together with their wealth-addicted stepmother, Barbra, they head on a cross-country journey from their foreclosed Bel-Air home to the Upstate New York retreat of the eldest Wang daughter, Saina. “Highly entertaining” (BuzzFeed), this “fresh Little Miss Sunshine” (Vanity Fair) is a “compassionate and bright-eyed novel” (New York Times Book Review), an epic family saga, and a new look at what it means to belong in America. “When the Wangs take the world, we all benefit” (USA Today). JADE CHANG has covered arts and culture as a journalist and editor. She is the recipient of a Sundance Fellowship for Arts Journalism, the AIGA/Winterhouse Award for Design Criticism, and the James D. Houston Memorial scholarship from the Squaw Valley Community of Writers. 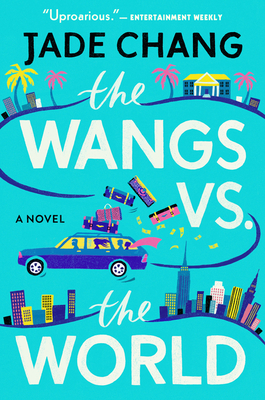 The Wangs vs. the World is her debut novel. She lives in Los Angeles.